Above, when the opponent No. 21 squeezed through Ibaka’s pick-and-roll, he had already pressed Jeremy Lin out of his position. In the picture below, even though it was Lowry’s foul on No.15, these two foul-calls were cleary double-standard. Randall clearly hit Lin’s lay-up hand while defending him, with the ball didn’t leave Lin’s hand when it happened. Like usual, no foul was called. An offense possession followed by a defense possession. The opponent no. 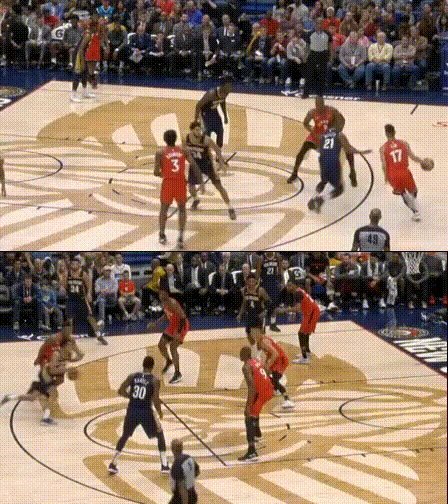 15 never stayed in front of Jeremy Lin from beginning to end, but pushed and knocked him all the way, also put both his arm on Lin at the end, clearly foul him. When the same guy did a lay-up, Lin ran along with him without contact, but was called for fouling.